Today in Masonic History Anson Jones is born in 1798. Anson Jones was a politician in the Republic of Texas. Jones was born on January 20th, 1798 in Great Barrington, Massachusetts. In 1820, Jones became licensed as a doctor by the Oneida, New York, Medical Society. By 1822 he began a private practice. Practicing medicine was not very lucrative for Jones and he moved several times before moving to Philadelphia in 1822. Sometime between 1822 and 1824, he was arrested by a creditor and closed his practice. In 1824 he moved to Venezuela, although he did not stay long. Before long, Jones had moved back to Philadelphia and in 1832 renounced medicine and moved to New Orleans to find a new profession. This time he went into the mercantile trade. Jones' luck in business continued to follow him and before long he was broke. Hoping for a new start, Jones moved in 1833 to Brazoria in Texas. There he opened another medical practice and this time met with success. 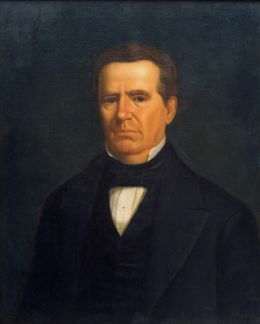 In 1835, he entered the political landscape of Texas when he began to speak out about the tensions between Texas and Mexico. It was that same year that Texas held it's Consultation, essentially it was a convention to discuss declaring independence from Mexico. They called it a Consultation to prevent Mexico from striking preemptively as they discussed independence. Despite the diplomatic use of language, Jones put forth a proposal to hold an official convention. Most were reluctant to agree to the proposal and Jones himself refused to be appointed as a delegate to the convention. By October of 1835, the Texas Revolution had begun and Jones enlisted serving as a surgeon and a judge advocate, the whole time holding the rank of private at his own insistence. After the revolution, Jones returned to Brazoria to reopen his practice. He found that James Collinsworth, fellow Texas patriot and signer of the Texas Declaration of Independence had setup a law practice in Jones' Office. Jones evicted Collinsworth and challenged him to a duel. The duel never happened, the two would continue to come into conflict with each other. Collinsworth would go on to start the Texas Railroad, Navigation and Banking Company. Jones opposed all of those entities and when Jones was elected to the Second Texas Congress on that platform. While in the Texas Congress, Jones drew up legislation to regulate the medical practice and called for an endowment to help establish a University. He also opposed the annexation of Texas to the United States. This was largely based on the fact that Jones did not feel that Texas had enough leverage with the United States and he feared Mexico would start another war over the annexation. The United States agreed on the latter point and did nothing with the Annexation request. President of Texas Sam Houston agreed with Jones on both of his points and appointed him Minister to the United States. In that position Jones withdrew the Annexation request. When Mirabeau Lamar was elected as President of Texas he recalled Jones. Jones was elected immediately to a partial term in the Texas Senate where he opposed Lamar's administration. In 1844 Jones was appointed as Secretary of State by Houston who had been reelected as President. Great efforts were expended to get trade deals with Europe and Jones hoped to either get enough leverage with the United States that they would annex Texas or that Mexico would finally declare Texas independent. Preferably it would be both. Jones would serve as the 4th and final President of the Republic of Texas prior to annexation. After Jones left the Presidency he had high hopes that he would be appointed to serve in the United States Senate. At least two opportunities came and went in 1857. On January 9th, 1858 after a dinner, Jones fatally shot himself in his room at the Capitol Hotel. Jones was a member of Harmony Lodge No. 52 in Philadelphia, Pennsylvania. There are some sources that claim that he was a Grand Master of the Grand Lodge of Pennsylvania, this claim appears to be false. During the Texas Revolution, Jones and four others sent a request to the Grand Lodge of Louisiana requesting a charter to form Holland Lodge No. 1. It is said that Jones carried the charter in his saddlebag during the Battle of San Jacinto. Jones would go on to be elected as the first Grand Master of the Grand Lodge of the Republic of Texas in 1837.